It’s Day 21 of my June Whole30 and I am still going strong! I have SO much to tell you all about my experience with this Whole30, so keep your eye out in the next few days! I will be posting a free one week Whole30 meal plan, providing links to all of my favorite Whole30 kitchen tools and corresponding recipe suggestions… PLUSSSS! A am going to be hosting a HUGE giveaway with some of my favorite Whole30 compliant products! Worried about missing the post? Be sure to sign up for my newsletter and I will send everything right to your inbox! 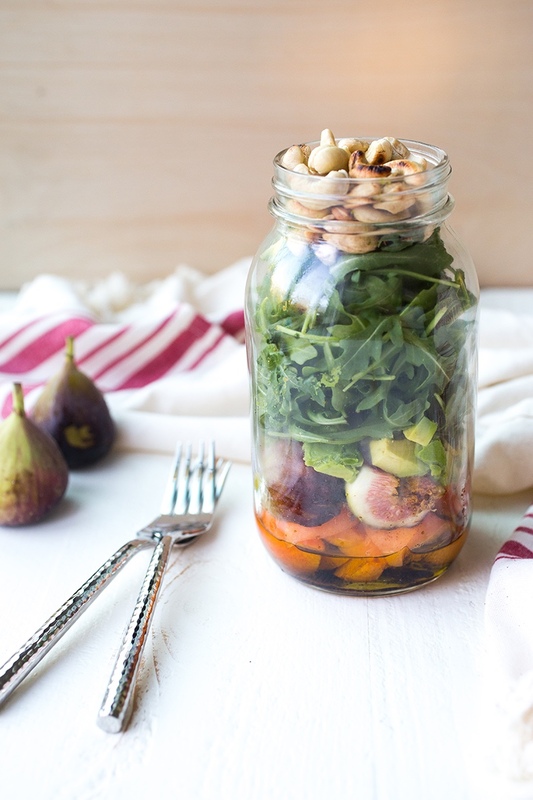 In the meantime, I wanted to share the recipe for this Mason Jar Apricot and Fig Salad. It is Whole30 approved and as always, paleo-friendly, gluten and dairy-free. Snacking is discouraged on the Whole30, so it’s really important to eat 3 satisfying meals each day in order to curb cravings throughout the day. I couldn’t be happier about this because I’ve discovered that recently, I’d become a chronic snacker. I work from home with a fridge full of goodies just a few steps away and I often skip meals in favor of smaller, bite sized portions multiple times a day. These smaller meals often may or may not include “healthy” sweets and treats that in small doses seem harmless, but when looked at all together… basically, I was definitely overdoing it with the “healthy” snacks. Anyway, I am thrilled that this Whole30 has forced me to cook more and prepare a variety of different breakfasts, lunches and dinners for both myself and my husband. Of course, given the rules of Whole30 (no “healthy” junk foods like pancakes, cereals, tortillas, smoothies and no grains), it’s pretty easy to overdo it with the eggs and bacon for breakfast. It’s also pretty easy to forget about veggies in the morning entirely. The solution? Breakfast salads of course! This salad uses delicious fresh fruit, avocado for a bit of fat, red onion, arugula and roasted cashews for a satisfying crunch! The best part about it? You can make it in a mason jar ahead of time and have it on hand for easy grab and go breakfasts and lunches! You can of course create these without a mason jar if you will be eating it right away, but preparing it in a jar means that you can let it sit for a couple days in the fridge without everything getting soggy. 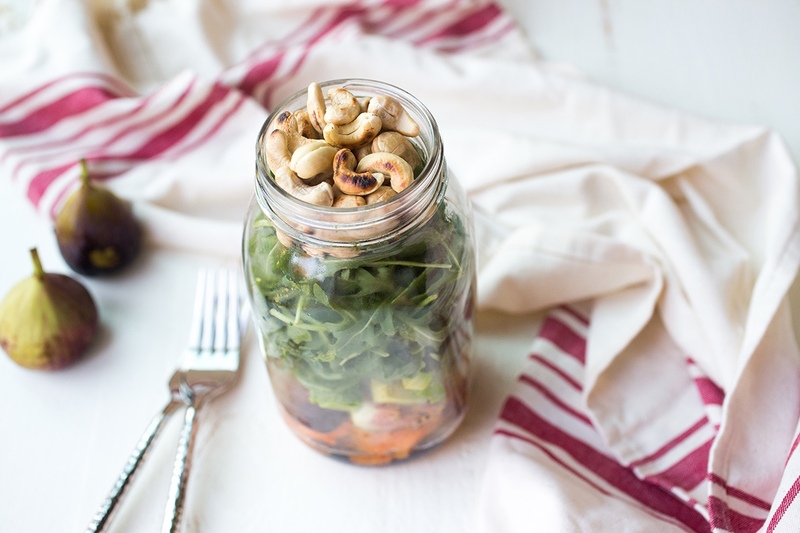 This recipe makes 4 mason jar salads in 1 quart jars but feel free to decrease or increase the recipe dependent on your needs! Add cashews and roast, moving around the pan occasionally, until slightly browned. Remove cashews from heat and spread out on a plate. Line up four 1 quart mason jars and add ingredients, divided into the four jars, in the order listed above, minus the cashews. Ensure the cashews have cooled before adding them on top of the arugula, otherwise it might wilt. The goal here is to go from the wettest ingredient to the driest, so it's important to add them in order! These can be stored in the fridge for up to 2-3 days. Sounds amazing! I have a hard time “processing” cashews. Any other nut you might recommend? Or perhaps sunflower seeds? Sunflower seeds would work… I think walnuts or pecans would be great choices too! Where do you find figs? I found them at Whole Foods!